This one really gives a new meaning to “black and blue.” I know it might seem odd, but bear with me on this. Firstly, as a quick glance at many of my past recipes will show you I am a huge proponent of pairing meat and fruit. Fruit brings a delicious acidity and sweetness that works as a beautiful counterbalance to the salty, umami qualities of meat. There are the classic pairings like pork/apple, turkey/cranberry, duck/orange, chicken/lemon etc. But if you dig a tiny bit deeper you see there’s a whole unexplored world of meat/fruit combos that work so well. 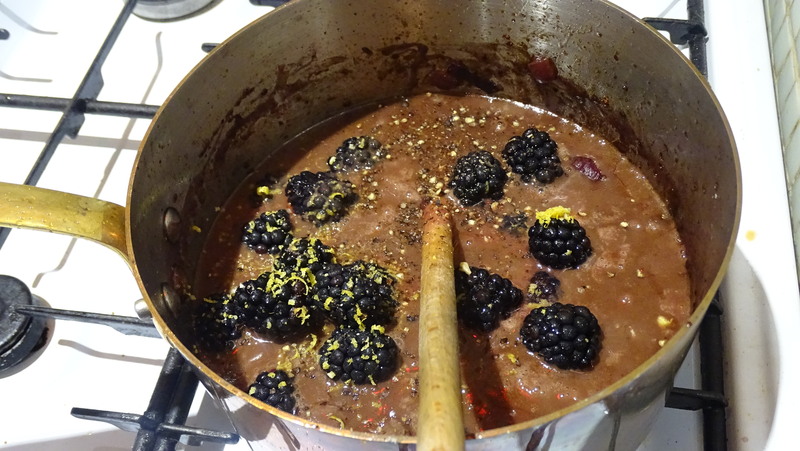 In this instance the blackberries bring a deep, rich, autumnal sweetness to the gravy. 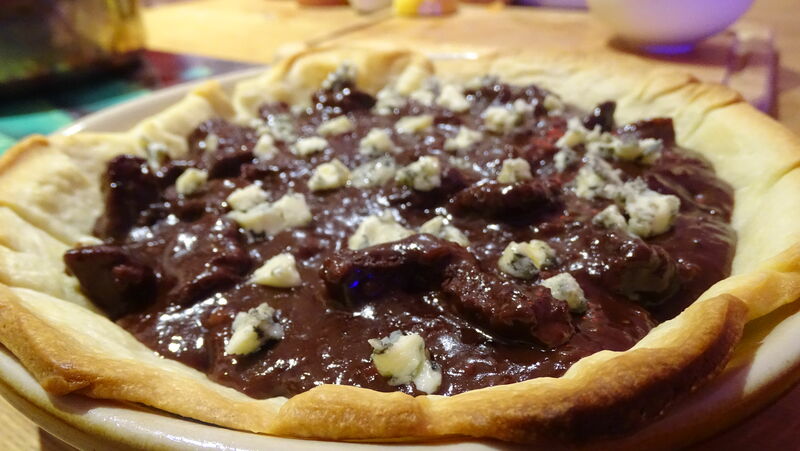 As for the blue cheese – in its crumbled form, not mixed in with the filling so much as garnishing it, it provides delicious pockets of sharpness that practically kisses the beef in your mouth. The final note for this – pastry matters. Firstly, never feel guilty about using pre-bought. Secondly, always feel guilty about only putting on a pastry lid. That’s not a pie, it’s a glorified casserole. I expect full pastry wraparound, best achieved with a sturdy shortcrust base and crisp puff top. For these ingredient amounts the best advice I can give is look at your pie dish. When you’re buying ingredients just consider – you need to fill that dish. Use your eyes, not my arbitrary measurements. 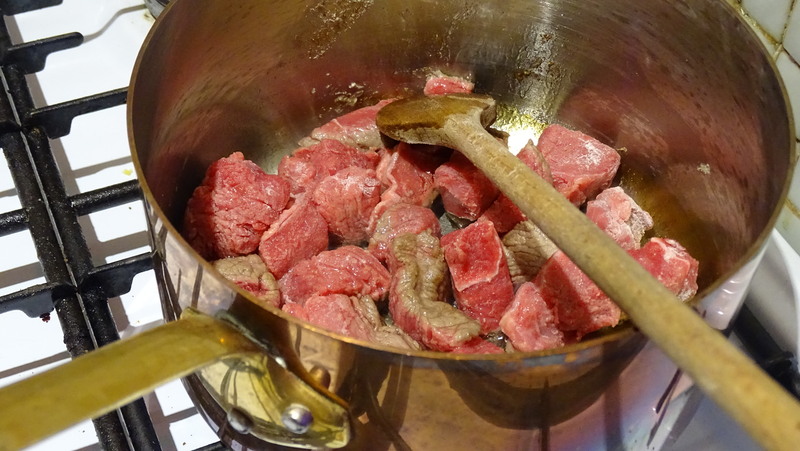 Cube and brown your beef in a hot, large saucepan then remove to a separate dish. Add a decent chunk butter to the saucepan, reduce the heat and add the onion. Fry gently until softened. Add 2-3 teaspoons of butter to make a roux. Cook on a low heat, stirring constantly, until it has turned nutty brown and smells of pie crust. 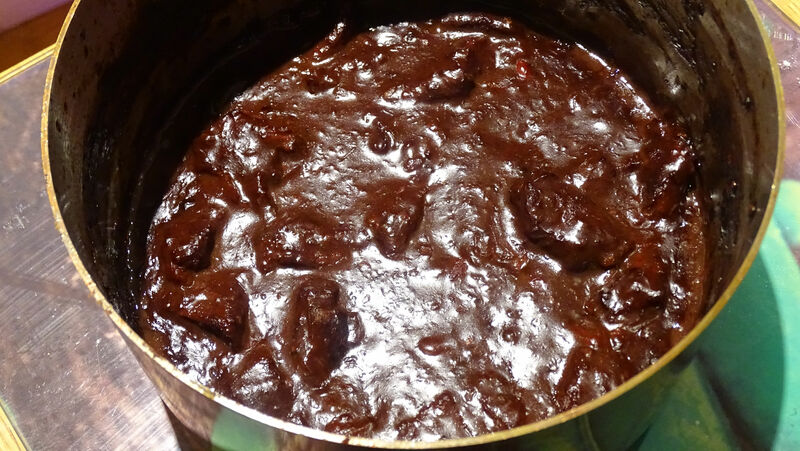 Add your wine and cold stock (coldness prevents lumps) and whisk until it has come up to heat and started to thicken, however you want to add more stock than necessary – our beef has plenty of time to stew and the sauce time to reduce. Add the beef back to the pot with the blackberries and the zest/juice of one lemon, and simmer gently for anywhere between 1 and 3 hours. The beef will be cooked after 1 hour, but the longer the better. If the sauce gets too thick, add more water, not thick enough…keep cooking. If you have time, put it in an oven proof saucepan and cook in the oven for 4 hours. Taste for seasoning as it nears completion. When the filling is ready unroll your puff pastry and turn your pie dish upside down onto it to measure the right size. Cut a slightly wider circle than the one made by your dish, as you’ll want it to reach up the sides. 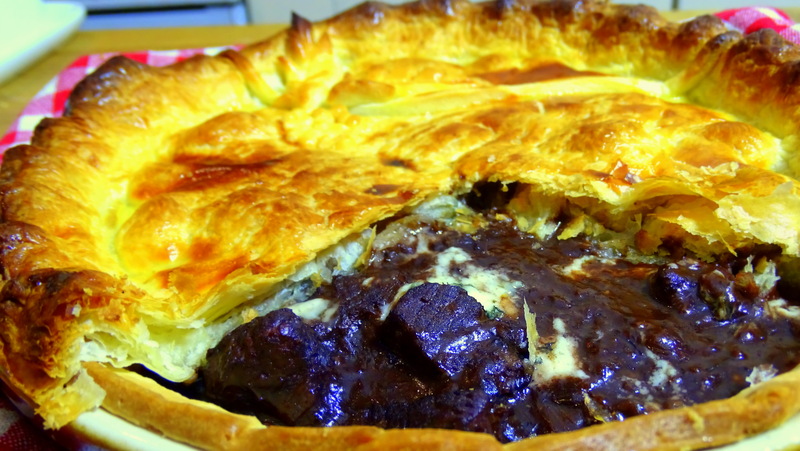 Grease your dish then place in the pastry. 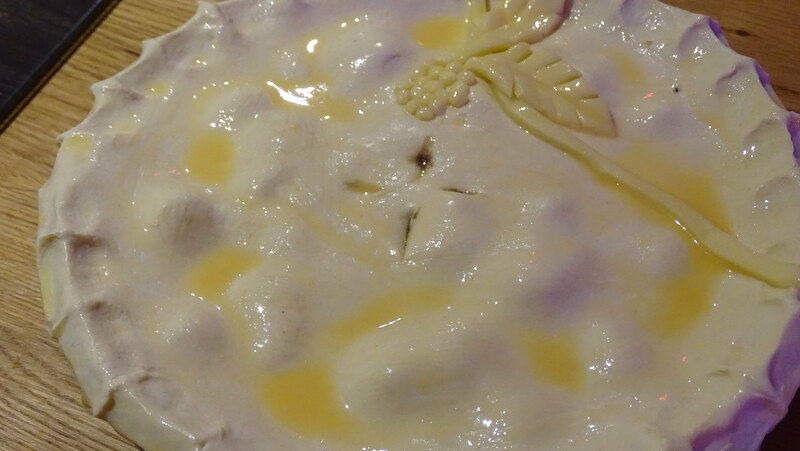 Prick it repeatedly with a fork (this is to prevent bubbles when cooking) then cover it with a layer of baking parchments. 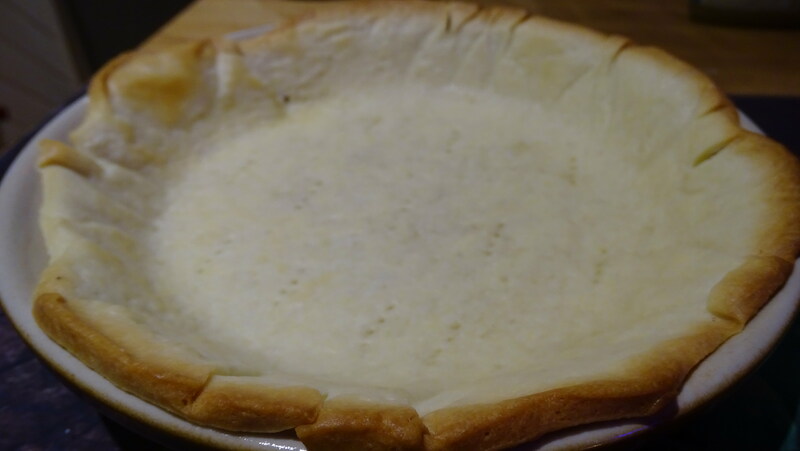 Fill the lined pastry with a weight – dry rice works well. Bake for 10 minutes or so at 200C. This is called blind baking, and it serves to ensure the pastry casing is fully cooked. Remove the weights and add the filling and crumble over a generous amount of blue cheese. Top with puff pastry and cut around the edge. Crimp with the back of a spoon and extra points for arty decorations. Brush with a beaten egg for an extra shiny finish. Bake until the top has turned olden brown, crisp and puffy. Allow to cool for 10 minutes before serving. Posted in Beef, Guesscipes, Mains, UncategorizedTagged beef, blackberry, blue cheese, christmas, fruit, guesscipe, meat, pastry, pie, protein, recipe, steakBookmark the permalink. Oooooo all my favourite food. Beef, blue cheese ( may add more than recommended) and blackberries. Defo going to do this recipe. It will be the first one in the New Year for the family. One question could you put the filling in a slow cooker on high to reduce.? Absolutely! The only thing you’d need to be cautious of is because it’s a fairly sugary sauce the sides may scold a little bit. If this happens no matter, just be sure not to scrape the burnt bits into the sauce itself when you transfer into the pastry.